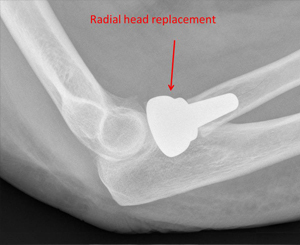 21 year old patient with fractures of the radial head and capitellum in the elbow.Treated with plate fixation of the radial head and screw fixation of the capitellum. This lady had a rather awkward fracture of the capitellum. Headless compression screws were used to fix the fracture, the suture anchors help to repair damaged tendons in the area. This is a textbook-typical displaced fracture of the capitellum, fixed with a "back-to-front" headless compression screw. 10 year old girl with badly displaced fracture of the radial head. Under general anaesthetic the fracture was reduced by using a wire as a joystick and anatomical reduction was achieved without the need for an incision. 47 year old lady with a displaced frature of the olecranon following a fall. Under general anaesthetic the fracture was reduced using a tension band wiring technique allowing early mobilisation straight away. This 70 year old lady sustained a badly comminuted fracture of the radial head following a simple fall. Unfortunately the fracture was not fixable and was then treated with a radial head replacement allowing good function.